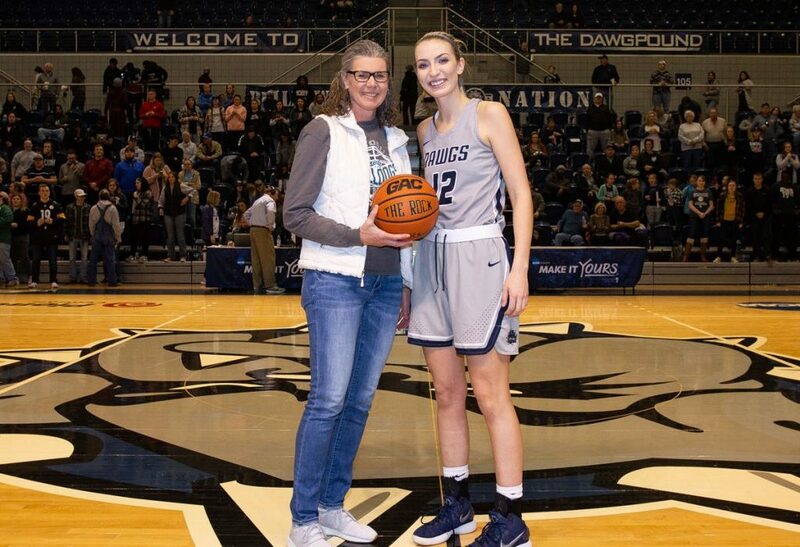 The 2,000-point club at SWOSU. Membership: two. Kelli Litsch (L) and Hailey Tucker. Photo courtesy SWOSU Sports Info. Right now in Weatherford is pretty good. Right now the Southwestern women’s basketball team has won 18 straight games. The Lady Dawgs are a win away from clinching a spot in the GAC tournament on the last day of January. SWOSU is scoring nearly 87 points per game and sends out three 1,000-point scorers and an All-American in the starting lineup each night. Yes, right now is pretty good. But back then was pretty good, too. In the not too distant past, there were some long winning streaks, too – one as long as 47. And there were some national championships along the way, as well. And All-Americans. Back then in Weatherford had a lot to offer, too. Someone who knows about both those eras still watches the Lady Dawgs today. Her perspective of late has been that of a fan, she has also spent time in the program as a player, a coach and an adminstrator. Southwestern legend Kelli Litsch with some hardware from ‘back then.’ Photo courtesy SWOSU Sports Info. Kelli Litsch, a three-time national champion and four-time All-American, has been watching this recent edition of SWOSU stars come out on top after 40 minutes quite a few times in recent years. And although both groups put many notches in the win column, each group got in done differently. “The interesting thing about this bunch is that their style of play is totally different than the style of play we used when I played and honestly, even when I was coaching,” Litsch said. “It’s the dribble-drive mentality and get up and down the floor and get as many possessions as you can and by the end of the game you’ve worn your opponent out chasing you up and down the floor. The game itself is for the most part the same. But there are differences even in that. But the fast pace is a style that current SWOSU coach Kelsi Musick uses to its fullest. “It’s different, but it is highly entertaining. It’s fun to watch. And when you look at the roster (and all the Oklahoma kids), kids want to come and play this style. It’s entertaining and the crowd enjoys it. Litsch is a home-grown Oklahoma product. Before she was showing the country her basketball prowess on the collegiate level, she was blazing a trail on the high school level, scoring at a blistering pace and bringing home two state championships to Thomas High School. So it is not lost on her that Musick is doing what she is doing with a cast largely made up of Oklahoma girls – girls that come to Weatherford and stay in Weatherford. “It’s because there are so many local kids that are within one or two or three hours of Weatherford that the support is unbelievable. They get good crowds to come and watch. There is definitely an interest there. There are a lot of western Oklahoma basketball teams that will come to home games, because they know the players. I think that’s one of the things that really draws people to the team this year. This is what 4,707 combined points (and counting) looks like! The two eras met up on the court, figuratively at least, recently when Hailey Tucker scored her 2,000th point. 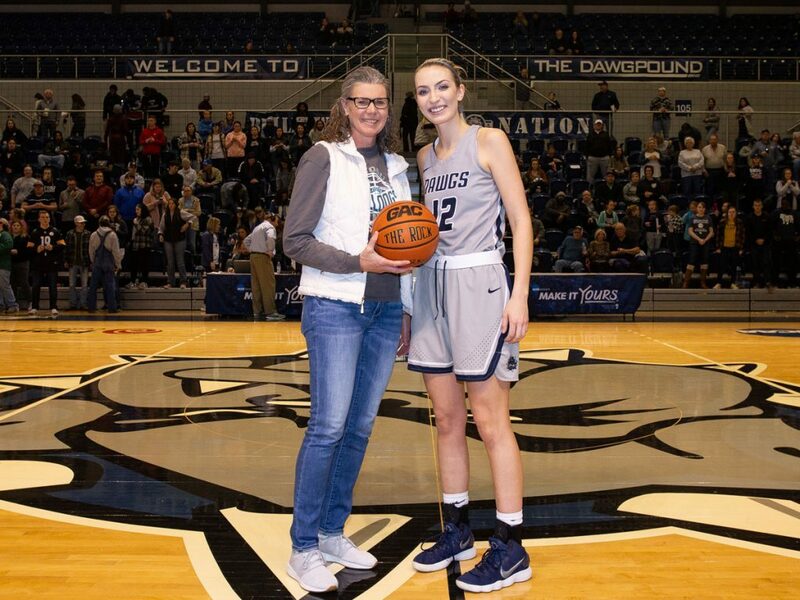 After the game, Tucker was recognized for that feat and among those to honor her was the only other SWOSU player to have accomplished it – Litsch. But what would happen if teams from the ‘right now’ and the ‘back then’ were to face each other in a real game? “That’s a good question and I think about it a lot,” Litsch said. “I played on some really good teams. My freshman year was probably the best team I played on. 34-0. Granted the NAIA was a little bit different than the NCAA. And postseason is probably a little bit tougher now. The competition, I would say, definitely is tougher now. “What we did well when I was playing was that we took away what the other team did really well. I would like to think defensively that we would get out and guard you. We had some defensive stoppers on some of those teams I was on. Fast or slow, the beat goes on in Weatherford. And it is a winning pace no matter what the tempo. Although a huge part of back then in SWOSU history, Litsch said she is enjoying right now, too.